OSU Urban Arts Space is a part of the revitalization of downtown Columbus, located in the "heart," between the Columbus Commons park and the Scioto Mile. A 10,000 square foot exhibition and non-traditional performance space, the Space welcomes over 35,000 patrons a year. Urban Arts Space promotes the work of local and emerging artists while engaging visitors with new ideas of how the community relates to art and design. The Summer 2012 Exhibitions present art as not only a form of expression, but also as a public good. Exhibitions on view feature large-scale drawings by local artist Jill Raymundo; revitalization projects created by the Neighborhood Design Center to revitalize underserved neighborhoods on the occasion of the organization’s 30-year anniversary; a juried exhibition of work by high school artists from across Ohio; and an exhibition of nine painters whose works utilize experimental applications of paint and unconventional materials. Vata, featuring Raymundo's graphite and charcoal drawings, runs through July 17. The exhbition is named for the Ayurvedic term for 'air and space.' Vata is a meditation on both the far-reaching possibilities and the intimacy of drawing. Presented by City Center Gallery, the multiple drawings series exhibition ranges from intricate, textural collage drawings of commonplace objects to large-scale cloudscapes based on images taken from an airplane window. Progress and Promise runs through August 11. Celebrating its 30th year, the Neighborhood Design Center embraces underserved neighborhoods, advocating design as a right, not a privilege. Inspired by the talents of students from The Ohio State University, University of Cincinnati, and Columbus College of Art and Design, projects in this exhibition range from signs to storefronts, gardens, streetscapes, and whole communities. The ultimate goal of the Design Center is to identify new possibilities for the City of Columbus and central Ohio. In this exhibition, renderings, models, before-and-after panoramas and more envision ideas for how to revitalize key areas downtown. The 2012 High School Juried Exhibition, which runs through July 28, is a one-of-a-kind art show designed specifically for aspiring artists who feel the need to break from the limitations of their classrooms and showcase their art in a professional environment. We Don’t Have All Night, running through August 4, presents the work of nine painters who continually challenge methods of representation through their experimental applications of paint and addition of unconventional materials. 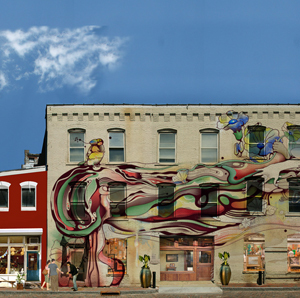 Image: Panoramic street art from the Progress and Promise exhbition. When: Vata runs through July 17; Progress and Promise through August 11; 2012 High School Juried Exhbition through July 28; and We Don't Have All Night through August 4. Inaugurated in 1985, the Lancaster Festival is a multifaceted, 10-day event that transforms the historic city of Lancaster, Ohio, with musical performances and family activities while getting local businesses, museums and residents involved. With the help of nearly 800 volunteers and the support of corporate and individual donors, service contributors and program advertisers, the annual Festival supports the local economy as well as the local arts. By bringing in guest artists and featuring popular musicians, the Lancaster Festival is the community's signature event and increases public awareness and appreciation for the arts. The streets and venues of Lancaster come alive with social interaction among residents and guests of varied economic and cultural backgrounds. There is an excitement in seeing “big city” talent right here at home. The Festival has something for everyone, including world-renowned pianist, André Watts (July 18), new music with Hayes Carll and Amanda Shires (July 19), a jumping night of swing with Big Bad Voodoo Daddy (July 21) and country/pop music star LeAnn Rimes (July 28). Our award-winning Lancaster Festival Orchestra, led by Maestro Gary Sheldon, celebrates 25 years this summer and will be featured in multiple concerts throughout the event. Don’t miss one of the Festival’s most popular free events, the ArtWalk. Held on Friday, July 20, downtown Lancaster comes alive as thousands stroll through local businesses to view work by area artists. 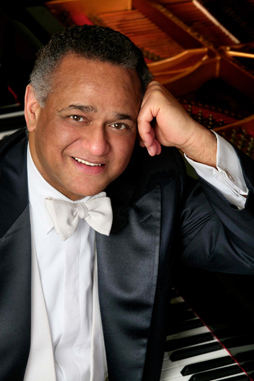 Pictured is world-renowned pianist, André Watts, courtesy of the Lancaster Festival. Contact Information: For more information, visit www.lancasterfestival.org, call 800-LANFEST (526-3378), or send an e-mail to lross@lancasterfestival.org. Artist Aurora Robson finds opportunity in what most people cast off. An advocate for plastic pollution awareness, Robson interrupts the waste stream by using discarded materials, primarily plastic bottles and caps, to create intricate, ethereal art with a message. Get a sneak peek of Franklin Park Conservatory and Botanical Garden's fall exhibition Sacrifice + Bliss: Aurora Robson with Robson’s Landmines sculptures on display now through April of 2013. Robson’s Landmines, sculptures created from P.E.T. plastic bottles, were installed in June in the Conservatory’s outdoor North Courtyard. See art and nature merge and interact as plants are encouraged to grow into the sculptures and birds and bugs to rest upon them. A time lapse camera captures the transformation as Landmines coexists with nature throughout the seasons. While Robson has exhibited internationally in museums, galleries and public spaces, Sacrifice + Bliss, which will open September 9 through April 28 of 2013, is the first exhibition of her work in a botanical setting. Large-scale sculptures will be integrated into the Conservatory’s collections, while paintings, collages, and smaller works will be on view in the Cardinal Health Gallery. A new installation was created onsite during Robson’s residency in June, made of plastic materials gathered during local river clean-ups led by volunteers. Through the unexpected medium of fine art, the Conservatory will raise awareness and provide tools to begin the path toward sustainability with this facility-wide exhibition, interactive educational components, collaborative projects and community involvement. 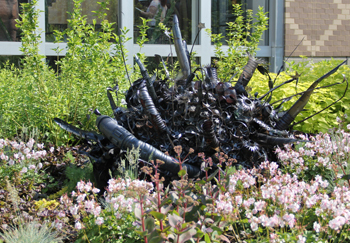 Image of Robson's work from Landmines, courtesy of Franklin Park Conservatory. When: Landmines is on view now through the end of the Sacrifice + Bliss exhbition which runs September 9, 2012–April 28, 2013. For more information/tickets: Visit www.fpconservatory.org or call (614) 645-8733.